Roy Anthony Hargrove (born October 16, 1969) is an American jazz trumpeter. He won worldwide notice after winning two Grammy Awards for differing types of music, in 1997 and in 2002. Hargrove has played primarily with jazz musicians including Wynton Marsalis, Herbie Hancock and Robert Stewart (saxophonist). Hargrove was the bandleader of the progressive group The RH Factor, which combined elements of jazz, funk, hip-hop, soul, and gospel music. Its members have included Chalmers "Spanky" Alford, Pino Palladino, James Poyser, Jonathan Batiste and Bernard Wright. 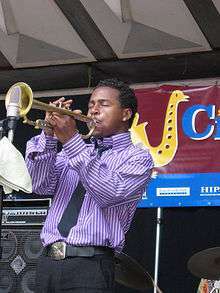 Hargrove was born in Waco, Texas, United States, to parents who early in his childhood discovered his musical potential, and with lessons on the trumpet, was discovered as a potential jazz talent when trumpet player Wynton Marsalis visited his high school, Dallas's Booker T. Washington High School for the Performing and Visual Arts. One of his influences was saxophone player David "Fathead" Newman, who performed in Ray Charles's Band at Hargrove's junior high school. Hargrove spent one year (1988–1989) studying at Boston's Berklee College of Music, but could more often be found in New York City jam sessions, and finally transferred to the New School, in New York. His first recording there was with the saxophonist Bobby Watson. Shortly afterwards he made a recording with Superblue featuring Watson, Mulgrew Miller, and Kenny Washington. In 1990 he released his first solo album, Diamond in the Rough, on the Novus/RCA label, along with four other albums. In 1993 he was commissioned by the Lincoln Center Jazz Orchestra, and wrote The Love Suite: In Mahogany. In 1994, after he moved to Verve, he took the opportunity to record with some of the major jazz musicians on With the Tenors of Our Time, including Joe Henderson, Stanley Turrentine, Johnny Griffin, Joshua Redman, and Branford Marsalis. Hargrove recorded Family in 1995, and then experimented with a trio format on the album Parker's Mood in 1995, with Verve artists bassist Christian McBride and pianist Stephen Scott. Hargrove won his first Grammy Award in 1998 for the album Habana with the Afro-Cuban band he founded, Crisol. He went on to win a second Grammy Award in 2002 for Directions in Music: Live at Massey Hall with co-leaders Herbie Hancock and Michael Brecker. In 2000, Hargrove used a jazz sound with a lot of groove and funk, performing and recording with neo soul singer D'Angelo, resulting in Voodoo. In 2002, he collaborated with D'Angelo and other soul artists, Macy Gray, the Soultronics, and Nile Rodgers, on two tracks for Red Hot & Riot, a compilation CD in tribute to the music of afrobeat pioneer Fela Kuti. He acted as sideman for jazz pianist Shirley Horn, rapper Common, on the album Like Water for Chocolate and in 2002, with singer Erykah Badu on Worldwide Underground. Roy Hargrove continues to tour to festivals and clubs in various parts of the world with the Roy Hargrove Quintet and the Roy Hargrove Big Band. 1 2 "Roy Hargrove Biography at". Jazztrumpetsolos.com. 1969-10-16. Retrieved 2014-02-07. ↑ Ron Wynn. "Superblue - Superblue | Songs, Reviews, Credits, Awards". AllMusic. Retrieved 2014-02-07.